Hot news: Apple is kicking data trackng apps from AppStore or forces developers to reduce functionality of those apps, limiting ability of such apps to help user to stay below the limit of their data plan and save from expenses on purchasing additional megabytes. Since iOS 4.0, data tracking apps for iOS constantly work in background and allow user to stay below the free limit of their data plan by monitoring data usage and warning user once e.g. 90% of the limit is exceeded. For some reason Apple recently forces developers of those apps to disable working in background! If this is not done by developer, the app is removed from AppStore. Given economic recession that spreads across the world, this Apple's decision is of course good for Telecoms but is bad for millions of users of Apple devices!! It's funny, right? Alsmost all data tracking apps in AppStore were updated by their developers and now are unable to work in background and help users to save $. Some developers removed their apps from AppStore (e.g. DataMan) in order not to turn the apps in semi-useless toys. 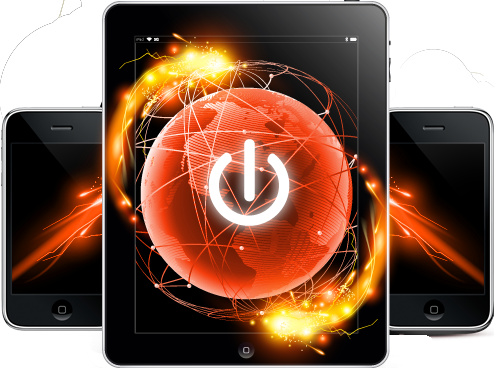 We are developers of "Download Meter" - a data tracking app for iOS. We've also received requests from Apple to disable work of the app in the background. It turns out that our app is one of two data tracking apps that remain in AppStore with ability to do constant monitoring! It seems our app will be removed from AppStore by Apple soon, so we'd like to ask you to tell iOS users to hurry and grab our (or the other remaining app called Threshold) from AppStore ASAP. App has reached top 10 Paid Utilities in 66 countries so it's very mature and useful for all iOS users. We can't provide you promocodes for our app since Apple does not accept any updates for app since Feb 2012. Ask us for any information! UPDATE: Apple has removed our app from sale on 4 September 2012. We've made all changes Apple requested from us and started to sell new app "Download Meter". It's very similar to original "Download Meter", but now it can't check data usage every 10 minutes due to Apple's new policy; this app checks data usage once user moves about 300m from his previous location (and device gets connected to another cell tower). Here is iTunes link to that new app. Data tracking app need to periodically get data usage from device and compare it to quota (and show Alert if quota is exceeded). Even if recent iOS devices (like iPhone 4s or New iPad) have 1gb of ram and dual-core CPU, iOS apps can't work in background more than 10 minutes after user switched from them. By working we mean "getting processor time to execute some tasks". Frankly speaking it's a shame! The only exception is if the app is VOIP client (like Skype), media player app (that needs to play music in background) or navigation app (that logs location of the user). Apps tell iOS that they play either of special roles by using special entry in file info.plist inside app's bundle (location, voip or audio as keys for UIBackgroundModes). Apple was rejecting apps that are not VOIP clients but try to pretend to be VOIP clients in their info.plist. So the only way for data tracking app is to pretend that they log user location (and use 'location' for UIBackgroundModes in info.plist). Since release of iOS 4.0, all data tracking apps were doing this. This ability was called "geotagging" by app developers. Developers of Download Meter application were trying to upload update of their app since February 2012, but Apple was rejecting every attempt to update it, telling that app should not use Location Services in background (by telling iOS that app is special via inclusion of 'location' for UIBackgroundModes in info.plist). The App Review Team told that app developers should make their app almost useless (by disabling work in background) - otherwise Apple would review the app from AppStore "soon". Here is the complete list of data tracking apps in AppStore that were (or are ) capable of constantly working in background and monitor traffic (they indicated iOS that app is special via inclusion of 'location' for UIBackgroundModes in info.plist). AirMeter - removed from appstore on about apr 26 2012. DataMan Pro - removed from AppStore in june 2012 or july 2012. It's interesting because similar app for WiFi usage tracking from same developer - WiFiMan is still alive (but it tracks only WiFi, not mobile internet!). This developer has also a version of the app for mobile internet usage tracking called DataMan but it has no geotag and thus it can't work in background at all. It was a free app before but since removal of fully functional DataMan Pro developer now sells this app for $1. Data Usage app was replaced with version that does not work in background all the time. You can check this by unpacking .ipa file of the app (it's a zip file), find info.plist inside the archive, and searching for word "location" - this word is absent in that binary file, meaning that app does not work in background more than 10 minutes after last use of the app AND when the location of device is not changing (e.g. if you are sitting in the office at the same place). Threshold app is the only app (besides Download Meter) that has full functionality. Threshold app was last updated on Jan 14, 2012. Download Meter OUR APP. It's still fully functional (works in background all the time). Last updated on Feb 05 2012. We are trying to upload a new update of the app since Feb 05 2012, but Apple rejects them because they told that they won't accept the version with geotagging enabled (i.e. Apple will accept only crippled version). As you can see only two last apps (Threshold and Download Meter) in the list are still able to work in background. Both of them were not updated since February 2012. Q: Why most of developers are removing their apps from sale? A: Because if they replace their app with limited version, all users who purchased the app before will update to this new version and they will get limited version. Q: Why version without geotagging will be "crippled"? A: Because app that is not "special" to the iOS will be unable to periodically get processor cycles while in background to fetch data usage and compare it to the quota entered by the user. So the user will have to run the app manually e.g. every day to see whether the quota was exceeded! 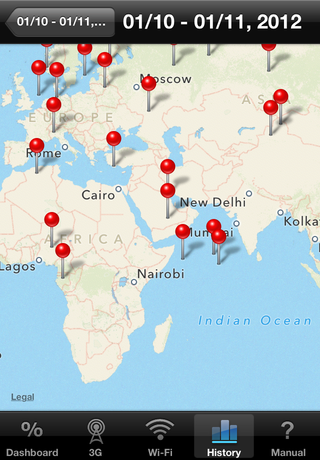 Q: Why version with geotagging is way more useful? A: Since app that can do geotagging will check data usage every 10 minutes even while in background, user will just have to enter the quota limit just once (on 1st run of the app) and never run the app again - the app will be running in background all the time and warn about exceeding quota. Q: Why do you think Apple is doing this? A: One of ideas is that Apple does not like that all geotagging apps are draining battery. But for some unknown reason the app for tracking voice calls (it has geotagging) VoiceMan and WiFiMan (app for tracking WiFi usage, it also has geotagging) live happily in AppStore while DataMan Pro (with geotagging) - the app for tracking mobile internet from the same author was removed from sale!! That's weird. Q: How would you implement multitasking on iOS if you were Apple? A: We think it's better to have a special entry for each app in Settings Utility, that lets user choose whether given app is allowed to periodically work in background. Like it's done for Notifications or for Geolocation Services. By default apps should not be able to work in background to consume battery - user has to manually enable it on per-app basis.